I don't have cable. I used to have cable. I paid $120 per month for Cable and Internet. And not the good cable with HBO either. Previously as mentioned above I paid $120 for both Cable and Internet. PS. No premium channels. The thing that I could not believe was that I could watch new episodes of shows that I love for free online. I just go to NBC.com, etc... and they keep the last 4 or 5 full new episodes to watch. FOR FREE! I have an apple TV so I can "airplay" it directly onto my TV. You can do the same with ChromeCast or just plug your computer to your TV using HDMI. Have that show that you can't watch online for free and isn't on Netflix? You can buy the season thru Amazon (cheaper than iTunes) for $30 to $45. If you have one or two shows like this a year, you are still saving a bundle by not having Cable. So cut the cord, read more, listen to awesome podcasts and enjoy some great shows on Netflix and Amazon Prime. 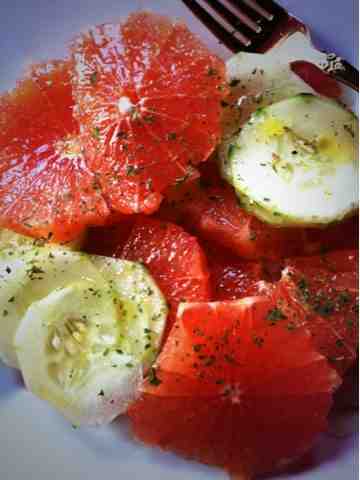 1 grapefruit and half a cucumber, sliced and plated.